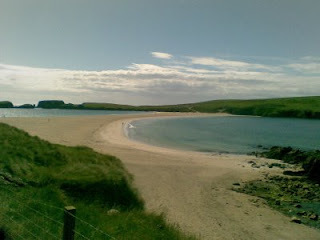 St Ninian's Isle in Shetland's South Mainland, yesterday. Mediterranean conditions (which means a survival time in the sea of, oh, 20 minutes). A tombolo is a double-sided beach. I think this is the largest in Europe. 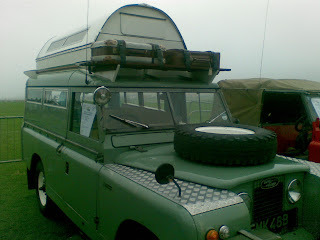 Gloria still unwell,but elsewhere, camper van culture rules! Decided to take the newly-MOT'd camper down to Brae for Martha's music lesson (ideal for parental hingin'-aboot) much to M's fury - she HATES the thing. With good cause, as it turned out, because Gloria nearly caught fire on the way back. The near-side front brake caliper jammed on, leading to a red-hot brake disc, smoke, wobbling and general disarray. There were some immediate repercussions, once we limped home. 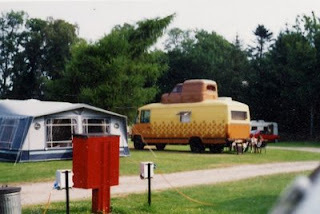 I cancelled plans to take the van south for the Connect festival (I'd even thought of taking it to T in the Park) and booked a Tangerine Fields tent with all mod cons for Inveraray in August. Then I contemplated either (a) tipping Gloria the camper over the cliffs at Eshaness (thanks for the suggestion, Rupert, but it's illegal) or (b) flogging it for £10 and a bottle of whisky. Wiser counsels prevailed, though, and this morning I took the van over to Peter Hurson's garage for the brakes to be serviced. No problem on the seven-mile trip to Ollaberry, and then, as the day turned unexpectedly glorious, I cycled back home. 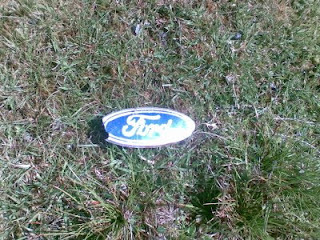 Finding, as I trundled along the edge of Ronas Voe, a sign: A cracked and abandoned Ford badge by the side of the road. A sign that in the avoidance of unnecessary unhappiness, the first rule is: NEVER BUY A CAMPER VAN ON EBAY. Especially not a Transit. 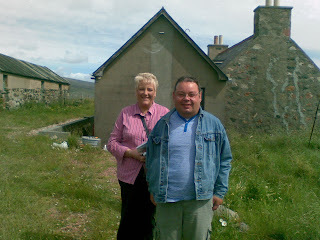 This is Billy Long and Jean Carmichael of Dalry in Ayrshire, currently on holiday in Shetland. Regular listeners to the TM Show, they came along to the Radiocroft to see how it all happens...great to see them and I hope they have a splendid Hanseatic Trifle at the Hay's Dock Cafe tonight! 13 people in a Volvo...shock horror! I mean, is that all? It was an estate, for goodness' sake! The idea that someone should be fined for having 13 people in a Volvo estate seems...a little unimaginative. The police wanted the car to be confiscated! 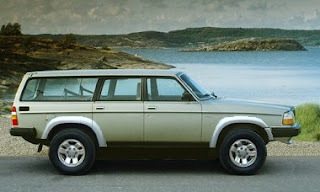 IT'S A VOLVO, for heaven's sake! Admittedly, only an S70, but still. As for the BBC reporter who could only fit TEN in, pshaw! I can remember when I was a boy, 10 people in a Ford Anglia on the Prestwick Airport loop...seatbelts? Seatbelts? Saturday was officially midsummer, though I believe that Friday was the longest day, for abstruse astronomical reasons. And so to Lerwick (again) for the launch of the Vaila Mae, a beautiful sixareen, the traditional open Shetland fishing boat of the 19th century. It's called a sixareen because it has six oars, each rowed by a separate crew member, and these boats were the core of the so-called 'far haaf', the fishing up to 50 miles out at sea in conditions of sometimes terrible danger. They had masts, dipping lug sails and would carry a small, smouldering peat fire. There were several tragedies caused by unexpected gales, notably the Gloup disaster. Hundreds of men died in these vessels. 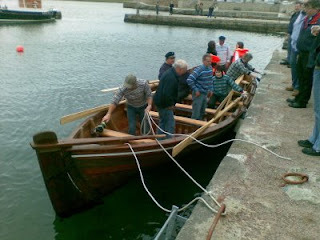 This boat has been built at the new Shetland museum and is the first sixareen to be constructed in Lerwick in a century. Though not the first in Shetland. Duncan Sandison built one in Unst (called the Far Haaf) in I think 1988, though it was destroyed by the great hurricane of 1992. A replacement, however, was built the following year and is in the Unst Boat Haven. 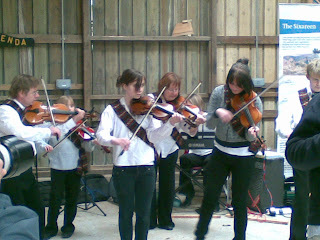 There was a big crowd at the launch, and the fiddle group New Tradition (of which my daughter Martha is a member) played. Later, Martha went off with pals to climb Ronas Hill, Shetland's highest point, for midnight on midsummer. 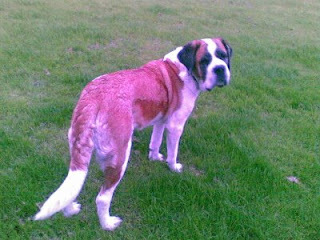 While, at around 10.55pm, Lulu the St Bernard turned lilac for no apparent reason. Absolutely knackered after today's show, which went really well, I think, apart from a two-minute hiatus when we apparently fell off air (not that we knew anything about it, as it wisnae oor fault!). 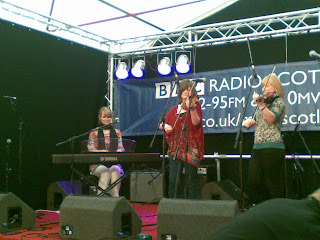 Well done to Jenny, Fiona, Ian and Ken from the BBC team. They came up on the ferry overnight, arriving today, and are back on the boat tonight. That's above and beyond the call of duty. Big thanks and congrats too to Kollifirbolli (pictured), Edwyn, Roddy and Andy (not forgetting Grace), Sheila Henderson, Mike and all the Shetland technical staff, Rick, Anita, Alistair, Nicola and Stefan, as well as everyone else at Flavour of Shetland and the Johnsmas Foy. 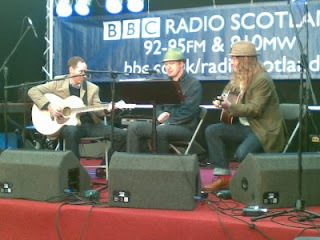 You can hear the show on iPlayer or Listen Again at http://www.bbc.co.uk/radioscotland or http://www.bbc.co.uk/iplayer for seven days after broadcast. The Fratellis are in the USA...and on yesterday's TM Show, we featured, at the request of LA listener Kevin, a list of suggested 'Scottish heckles' which Kevin could utilise during their acoustic set at Virgin Records in Hollywood Boulevard. It's amazing the folk you meet on the bus. This is Dan Godfrey from Newcastle, who was waiting at the Hillswick bus stop this morning with his purple Raleigh Chopper bike (complete with Darth Vader bell!) heading for Lerwick. 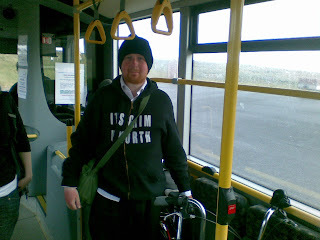 I nearly crashed the car the other day when I saw Dan (dead ringer for Badly Drawn Boy) toiling up the hill out of Lerwick with his Chopper, heavily laden for touring with a mighty rucksack. I mean, who goes bike touring on a Raleigh Chopper? The answer became clear after a few minutes conversation: an art student does! An art student on a mission, as it emerged. Dan was in Hillswick engaged on a project sparked off by the discovery of three old postcards in the attic of his mum's house. He had no idea what the pictures were of, though they were all coastal scenes. It turned out they were all (quite rare) 1920s JD Ratter pictures of Northmavine in Shetland - Hillswick, the Grind o'da' Navir at Eshaness and the beach just round from us, with the Drongs in the background. Before working out where he might have to go, Dan decided to travel, by Chopper (and train and bus, it should be said) to wherever the locations were, and try to recreate the same scenes in colour and black and white. He was loaded down with three stills cameras and a video camera, and the Chopper trip was filmed too, using special brackets on the bike. 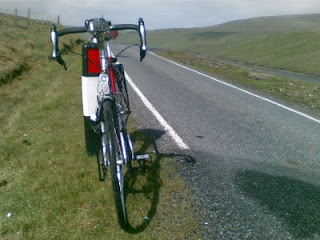 He had cycled, he told me, the entire 37 miles from Lerwick to Hillswick, though 'it nearly killed me'. I'm not surprised. Choppers are not built for long distance work. Or Shetland winds and hills. long term. Oh, and why a Chopper? 'I'd just always wanted one.' Fair enough! 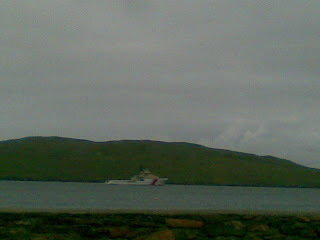 Biggest ship I've ever seen anchored off Hillswick - the coastguard tug Anglian Sovereign. If the weather had been nicer I might have been tempted to take a paddle round her in my inflatable kayak....but it was horrible. Meanwhile, BT still haven't fixed the broadband to the Radiocroft, 48 hours after it failed. And because of the power failures on Tuesday, which took the show off air for over an hour, I'm having to broadcast from Lerwick for the foreseeable future. It's understandable, but infuriating. Having snaffled the last steak pie available this lunchtime from Herds the butchers in Aberdeen, I confidently asserted that this was the finest pie of its type I had ever tasted, and that the future of Scottish tourism rested on The Great Steak Pie Trail. The TMS listeners' list also fails to coincide at any point with the SFMT award winners. But don't let that put you off! I was once asked to be a judge for the Scotch Pie World Championships, so they're obviously fine fellows. Tarbert Loch Fyne: 'The butchers': Suggested by Anne from Skye, who also recommended the lamb from Bowmore in Islay. Aberdeen: Herds Butchers for me, but Ewen makes a strong case for steak pie and chips from the Dutch Mill Hotel in Queen's Road. Glasgow: Jaconelli's Cafe in Maryhill Road has already been recommended in a national newspaper for its ambience, but an anonymous texter punted its steak pie slice supper (peas extra). Oban: Jack remembers, nostalgically, as you do, eating the pies from 'Gladys' and then playing fruit machines upstairs at the Gateway. Lochinver: Jenny suggests The Pie Shop. Which seems appropriate. Montrose: An anonymous paen of praise for the 'runny fat' available locally. Inverurie: 'Lord of the Pies' claims either the steak or mince pies available on match days at the Loco Works ground are magical. 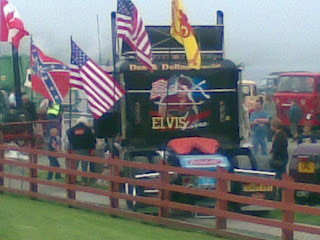 Wooler in ENGLAND! Jason in the Borders travels 15 miles over the Border for his pies. What can I say? Troon: David Blair says Connors in Troon for their New Year pies. Peebles now supplies him with excellent 'pepper gravy' pies. Hampden Park in Glasgow supplies reasonable pies, but he did ask 'oven cooked or deep fried'? Phew! All that and I can also tell you that you CANNOT be breathalysed for erratic bicycle riding, NOR can you be disqualified from driving for riding a bike drunk. But you CAN be charged and fined. Keep pedalling! Rocketed up the road in fine weather from Glasgow, stopping for breakfast and a massive supermarket shop at Tesco in Dundee. It's a Tesco Extra, and they have catering packs: tons of pasta, rice and gallon cans of cooking oil. 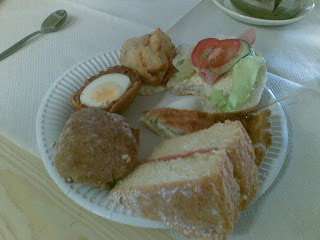 Roll on the advent of Tesco in Shetland, I say. Fill up with reasonably-priced diesel, then more rocketing to LIDL in Aberdeen, for hundredweights of dogfood, loads of coffee and German biscuits. From there, a quick hop to Beechgrove for the programme, and then it's the boat north. 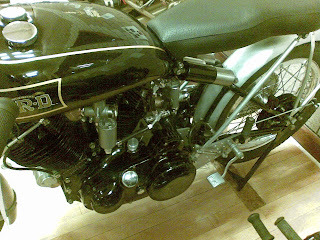 Looking forward to the Shetland Classic Bike and Car Show at the weekend. Oh, and BT have FIXED the ISDN line! Thanks a million to Ernie and the other on-the-ground engineers. As for the management...see below. 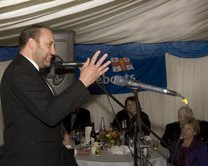 In full after-dinner entertainment mode at the Old Pulteney Grand Prohibition Ball (see below). Meanwhile, I hate BT. Not their employees, and certainly not their engineers, who are fine folk. It's the management. They make you pay extra for business lines, then, when you try to report a fault, make you go through residential faults, who, after ages, try to put you through to business faults. Who won't call you back or answer their phone. It's not just incompetence, it's DELIBERATE incompetence. What happened to fault tracking online? Too convenient, and too revealing. 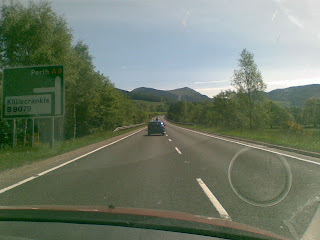 This is just an example snap of the trip south on the Inverness-Perth stretch of the A9, which I've been driving for 35 years and remains a nightmare of frustration and terror, no matter how much meditative calm I try to instil in myself. Caravans! I will never have one again. Camper vans! I'm selling Gloria forthwith. Motorcyclists! Are they/we all deranged? People in big off-roaders who think they can simply push other people out of the way! People in open-top sports cars wearing ridiculous hats to avert frostbite (the people, not the sports cars). Folk who drive at 45 mph. Folk who try to overtake by increasing their speed to ONE mph faster than whatever they're overtaking. People who go from the inside to the outside lane at the last minute to turn right. Have to say I'm impressed with the Citroen C4 I currently sort of own...fantastically frugal (diesel), and thank goodness in the current fuel mania. And fast enough to, at one point today, rattle past a tardy Aston Martin Volante with absolute Gallic contempt. Zoot Alors! So, anyway. Safely in Glasgow, only to discover that I've locked the folding bike and left the keys in Shetland. I'd snip the lock but it's a Kryptonite and harder than a microwaved lasagne crust. I guess I'll have to walk. No driving in the Dear Green Place. It's even more frustrating and terrifying for car conducteurs than the A9.